Play Spin Town Slot Online with 500 Free Spins! Spin Town is a 5 reels, 40 paylines online slot game by Red Tiger Gaming. 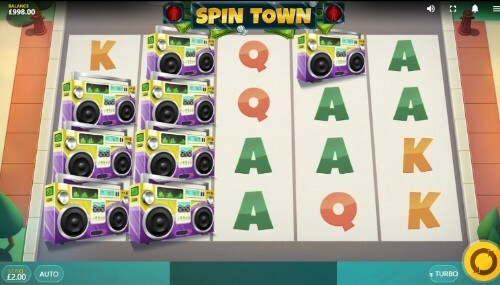 Spin Town has Wild, Sticky Wild, Multiplier, and Expanding Symbol features and an RTP of 96.18%. Rose Slots is your best option for playing Spin Town, and is also home to more than 500 other great UK online slots including Fluffy Favourites, Starburst, Rainbow Riches and Great Rhino. We have to hand it to Red Tiger Gaming here. We at Rose Slots have seen a lot of different themes used for online slot games. There are almost as many themes as there are online slots, and it’s very rare that we come across something that looks and feels totally new. We can say without reservation that Spin Town doesn’t feel like any other slot we’ve ever played. It’s a March 2019 release from the Red Tiger studio, and it’s like a breath of fresh air. When developers sit down to discuss what might make an attractive theme for their next slot, we imagine they think about what's popular at that moment, and what's known to have mass appeal. We don't know how long someone at Red Tiger had to argue to persuade other people that the basic task of crossing the road would work for a theme, but we're glad they did. It worked for the classic video game ‘Frogger,' and it works for Spin Town! This beautifully animated and lively slot, full of authentic sound effects which will be familiar to anyone who's tried to cross a busy street in London, is based around a large and colorful 5x4 layout of rows and reels. There are forty fixed paying lines to be found, and a whole host of fun with different bonus and wild symbols which we'll get to later in the review. The reels are all laid into a road, with the pavements forming a border on either side of it. At first, everything seems peaceful, with birdsong in the background, but as soon as you spin the reels everything changes! Even a slot of this imaginative quality isn't immune from appearances by the playing card symbols, and they're here again to represent the lower values; in this case, they run from 10 through to A. Above them are a couple of items you might drop in the road - your keys, and your wallet. The next most valuable symbol is a boombox, followed by a crash helmet, and a suitcase full of money. Whoever left that on the road has had a very bad day, but as it's the most valuable of the basic symbols, you'll be pleased to profit from their misfortune. There are several different wild symbols in this slot, but they don’t land on the reels so much as walk across them - which we’ll explain when we come to the bonus features - and there are also additional bonus symbols. They come in the form of a football, an old vinyl record some British guards of the kind you’d find outside Buckingham Palace. Given how early we still are in terms of Red Tiger Gaming’s development, you could almost consider Spin Town to be a statement of intent. They introduced themselves to the UK online slots scene in 2014, setting up camp on the Isle of Man. All of their senior and design staff have come together from various other entertainment and casino companies, and they share a vision of making slots bolder, bigger and more fun to play. Spin Town is a perfect example of that; the spirit of fun runs right through the slot from the look to the functionality. It may even be the best of their releases so far. Given that those releases include the also-excellent Ancient Script slot and Cinderella’s Ball slot game, that’s not a statement we make lightly. Sleepy Wilds are represented by an elderly couple. They cross the reels one spin at a time, but they might fall asleep halfway across. When they do, they become a sticky wild and will stay there until they wake up. The Speedy Wilds are a much younger pairing, and they need to get across the road in a hurry. They can move up to two positions every time you spin, meaning they can help you achieve payouts on different areas of the reels if you’re lucky. The third of these randomly occurring features is the Couple Wilds, who are out looking for love. If they encounter each other in adjacent rows, they’ll merge into an expanded wild, and also a 2x multiplier for any winnings they help you to receive. If you think all of that sounds crazy, wait till you find out what the bonus symbols can do! As you'll recall, there are three sets of bonus symbols - the footballs, the records, and the Palace guards. Landing three of a kind of any of them will trigger their associated bonus feature. Three guards will get you the Guardsman’s March, in which two giant guard wilds, which are two rows high, will cross the reels from opposite directions, one spin at a time. Three records bring you the Rock and Roll Shuffle. Four musicians who look suspiciously like the Beatles will wander across the reels, acting as wilds. Depending on their mood, each of them might walk back and forth up to ten times. Finding three footballs will attract the attention of the Hooligan Advance, a gang of football hooligans who may cross from either side. They stay packed closely together, meaning you could have wilds on adjacent reels and rows for big wins. All of the above makes for one of the most expansive and immersive experiences we’ve had playing online slots for a while. Gameplay is always wild and exciting, and there’s always another set of wilds just around the corner, waiting to change your game for the better.